— Greywater reuse treatment systems having a rated treatment capacity up to 5,678 L/d (1,500 gal/d): This applies to onsite residential and commercial reuse treatment systems that treat combined greywater, those that treat laundry water only from residential laundry facilities, and those that treat bathing water only. See 8.1 for performance testing and evaluation. — Commercial greywater reuse treatment systems: This applies to onsite commercial reuse treatment systems that treat combined commercial facility greywater with capacities exceeding 5,678 L/d (1,500 gal/d) and commercial facility laundry water only of any capacity. These systems shall be performance tested and evaluated at the location of the reuse system installation, using the greywater generated onsite from the facility serving the treatment system. See 8.2 for performance testing and evaluation. 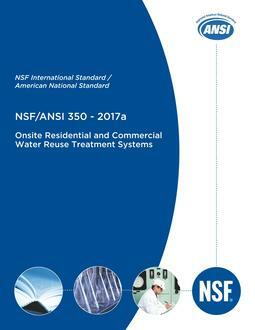 The key elements of a field evaluation of a commercial onsite reuse treatment system are described in Annex A. The Standard is intended to address public health and environmental issues only. Actual performance for any site or system may vary, depending on variations in raw water supply (such as in alkalinity and hardness), greywater constituents, and patterns of use. The end use of the effluent is the responsibility of the owner, design professionals, and regulatory officials. Management methods and end uses appropriate for the treated effluent discharged from greywater residential and commercial treatment systems meeting this Standard are limited to subsurface discharge to the environment only. Effluent quality criteria consistent with these uses are described in 8.5 ? Criteria. System components covered under other NSF or NSF/ANSI standards or criteria shall also comply with the requirements therein. This Standard shall in no way restrict new system designs, provided such designs meet the minimum specifications described herein.